Looking for more bars in Paris? Don’t miss out on getting a copy of our Paris Night Guide where we share a long list of our favorite bars in the city! Whether they be full of partiers into the early hours of the morning or friends meeting up to chat over drinks, rooftop bars in Paris live up to the prestige of their title. Each rooftop bar has its own unique view of Paris and with INSIDR’s top 5 picks, the collective views make up almost the entire cityscape. If you’re looking for somewhere to go out at night but don’t want to miss out on Parisian architecture or sights at dusk, here’s where to find the best rooftop bars Paris has to offer. Fancy having a cocooned happy hour overlooking the panorama of Paris? Mount on the top of Galeries Lafayette and enjoy your champagne in the Arctic-styled igloos! They also offer tapas & classy munchies such as oysters and foie gras to pair up with your bubbly get-together time. Continuous service hours: 11am to 7.30pm from Monday to Saturday & 11am to 6pm on Sundays. Atop a Haussmannian building overlooking the historic Pont Neuf, the futuristic dome of KONG provides visitors in any seat a panoramic view of Paris. While the restaurant is on the top level and the bar on the 5th floor, why not have dinner overlooking the Seine followed by drinks in the modern bar? Every Thursday night there is a DJ from 9pm-2am and on Friday and Saturday nights the bar becomes a club with doors opening at 11pm. The atmosphere of both the restaurant and bar is cosmopolitan, yet edgy. The bar serves everything from brightly colored cocktails to detox non-alcoholic drinks, that we at INSIDR highly recommend, especially the delicious cranberry Elixir Detox. KONG has hosted many high-profile events and even shot film scenes in their restaurant, so don’t miss out on getting your photo taken there too! Similar to KONG, at Communion you will find both a restaurant and a bar/club packed with young Parisians dancing throughout the night. Communion in particular hosts Foodtruck nights on their terrace as well as many club events that last until 5am. If you are looking for a more casual rooftop bar to eat, drink and dance, Communion is for you. Check their website before going out for more details about their upcoming events this fall! 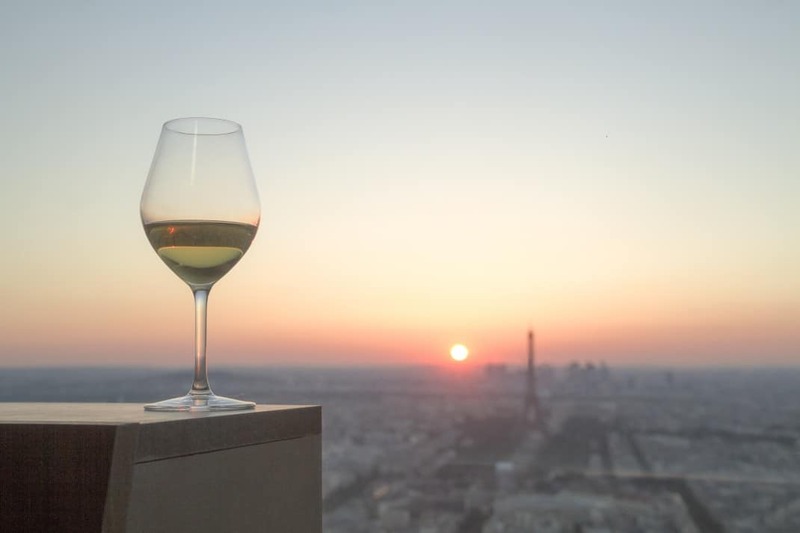 If you are looking to sip a glass of wine while watching the sunset beyond the Eiffel Tower to one side and Notre-Dame to the other (yes this really can be done,) then head to Le 43 Bar Cocktails on top of The Holiday Inn Paris Notre-Dame. Due to the centrality of this hotel’s location, visitors can see the photogenic and Instagram-worthy sights of Paris until 10pm. Looking for a bit of French culture with your cocktail? Au Trinquet is a rooftop bar in Paris that serves Basque country classics, and aperos on Thursday evenings. Located along the Seine in the 16th arrondissement, this rooftop bar is decorated with simple hanging lights that will make you feel as if you have left the busy tourist-filled city and escaped to a vibrant rooftop party with Parisian locals. Le Perchoir is a rooftop bar with three locations in Paris: the Marais, atop the Gare de l’Est and in the 11th arrondissement. Each location will provide you with a different atmosphere, different Parisians to interact with and most importantly, different views of Paris. Le Perchoir is our INSIDR’s team top choice for sipping a crafted cocktail and enjoying a relaxing evening looking at the Eiffel Tower or Hôtel de Ville, the Gare de l’Est central window or Parisian apartment buildings.